Those loveless, self-interested humans continue to confuse the business brains then Mitch? The spread (or lack of) on the business ranking side (73%-60%) suggests quite a lot of guessing or tuning in to rhetoric as well eh? That pretty much says it – though, I as we always say, ‘hope is not a strategy’. I am not sure if the business brains are confused, or guessing. If you hone in on the points you made – product information and general information – which I agree with – then there is nothing ‘Social’ about it. Just another way for people to get information. Providing another channel is of course important, but it does not solve the ‘Let’s get closer to the customer’ problem. At least not yet… Musings for a Sunday afternoon. My comment post lost some content that was in chevrons – maybe it looked a bit HTMLy?? I want to learn about new products: So that I can get discounts, or so that I can look informed to my friends, or so that I can avoid a bad purchase decision. I need some general information: So that I can avoid your horrible call center, or so that I can actually buy some of your stuff…. Interesting information Mitch. Sounds to me like businesses are still working on assumption and hype rather than actually listening to their customers. Certainly with the smaller businesses I deal with there is a massive opportunity to simply enter into a new, listening focussed dialogue with customers. A simple “thank you for your business” and “how can we better serve you” conversation, if handled properly, recorded and fed back into the business can be invaluable. Thanks for stopping by – yes, I agree that many business are operating at a level where their customers are not quite ready. I do still believe there is an opportunity here. Simply, do not put the cart before the horse. I think businesses are listening to the more vocal customers, and might even be chastised for not being on certain channels. The dose of reality is, however, required. Where they are not listening to their customers, in a different way, is on the standard channels, like phone and email. Meaning, too much energy spent on social, maybe not enough on traditional. Thanks Mitch My point exactly. One of the issues however, I believe, is that this type of work is a bit of an orphan. There are typically plenty of “hunters” in businesses looking for leads, prospects etc. However, when it comes to “farming” for what I like to call actionable insight then I’m not sure that we often have those resources available. Maybe this gap is driven by short termism but I believe businesses are missing a massive opportunity to differentiate based on better customer dialogue. This is the thrust of my clienteer concept, some new skills, different KPI’s and a separation (which the customers love) between a sales contact (still necessary of course) and a clienteer contact. Mitch, thanks much for sharing something that’s been on my mind — nice data to boot! Here’s my $0.02. I wonder if the data reflects something else entirely (I’m curious about how we’d measure my hypothesis) – that people feel connected to people, not brands. In other words, if I have a one-to-one exchange with a tech support person via Twitter and the experience is positive, I feel connected to that person, and it’s *that* exchange that may lead me to rave about the brand, resulting in a mistaken assumption that the buyer’s become part of the brand community. The buyer may simply have become part of the Jill-the-Tech-Support-Gal-Rocks community. By extension, the more anonymous or mediated-through-corporate-speak the exchange is, the more non-social (and thus irrelevant) it is. The engagement then is all about a fast link to a special. IMO, community really is about the *social* – not the media, not the marketing – and successful social media marketing practices will have roots in social psych and anthropology moreso than branding. I get what you are saying, directly from the data – people connect with people, not brands. I think you nailed it. The question is how can a large business scale to that. That is the really hard part, individual relationships do not scale for big businesses – this is where SMB has an advantage. I would argue that this data is displayed incorrectly and is telling an inaccurate story. 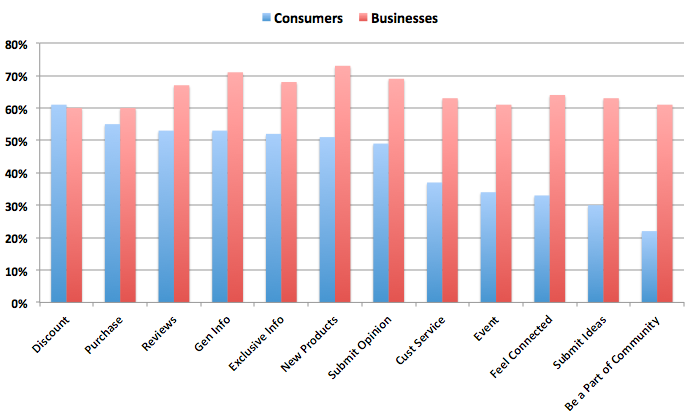 I took the data points and laid them out side by side, and it is clear where marketers defer from consumers with regards to their opinion, but also paints a different story – marketers just think consumers care WAY more than they do about social. Edit: The conclusion is that marketers prioritize all activities on about the same field – their perception of how much each thing is worth to a consumer is way off. 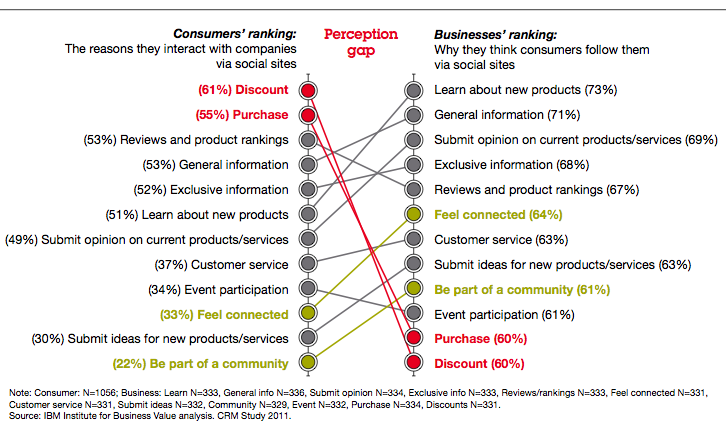 Consumers on the other hand have a clear differentiation between activities. Thanks for the comment, really it is not as clear as I would like it either. As I noted in the post “I will be cautious, as data can be interpreted differently from person to person”. As others have said to me, the gap, while supported with numbers feels more qualitative than quantitative. The questions might not be perfect, but the clear message to me is that businesses rank the discount and purchase far lower than than 8 other metrics. The consumers view this slightly differently, putting these measures first. So, from a pure percentage percentage I can see your point. However, I do not think it is telling an inaccurate story. Companies need to realize that social media culture has allowed consumers to become more intelligent (or at least more entitled). Companies tend to have this false notion that loyal consumers exist that want to learn and be part of there brands. This is not the case. While sometimes consumers on social media will “like” something because it is “cool” they generally are interacting in hopes of getting something like a discount or to simply purchase the product offered as shown in the study you mentioned. Those who are interacting with brands on social media networks are away that by interacting they are supplying this companies with cost free advertisements. They understand that when they interact all of there friends and followers are now aware of there actions and potentially the companies products and services therefore by giving this advertising boost to the company they expect something in return for their work. Once businesses understand this and embrace is social media branding will be able to evolve, until then it will start looking more like spam and unfortunately begin to devalue the social networks themselves. Who Leads the Social CRM Market? – An Analysis Is Twitter a Customer Service Platform, Protocol or Channel?